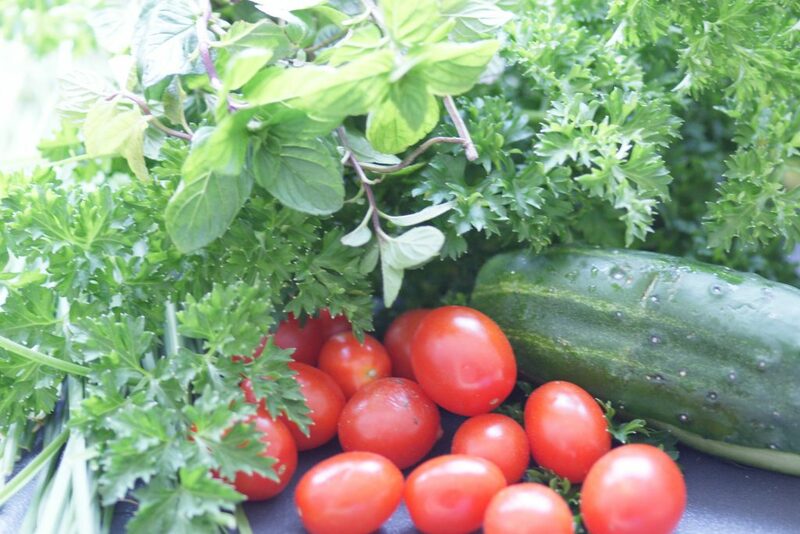 My herb pots are overflowing with parsley and mint so I know it is time to make tabouli. It is one salad that I can make at the beginning of the week and it tastes good all week long. It makes a perfect lunch even if I don’t have refrigeration or I can serve it as a main dish after a long day of culinary medicine lectures at the university. Those lectures are so much fun. I love inspiring students to use whole foods, prepare them simply and to focus on the relationships around the table. Food brings people together and that is such a fun way to nourish the soul. I really love to cook. That nourishes my soul too. But somedays time is at a premium. Even still, freshness is my goal for every meal. This salad is just that. Freshness comes from the herbs, the grains, the produce and a squeeze or two of lemon. I try to always keep all of these ingredients on my pantry shelf or in my garden because it is such a great go-to salad. 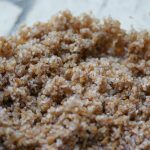 Bulgur is cracked wheat that has been partially cooked. 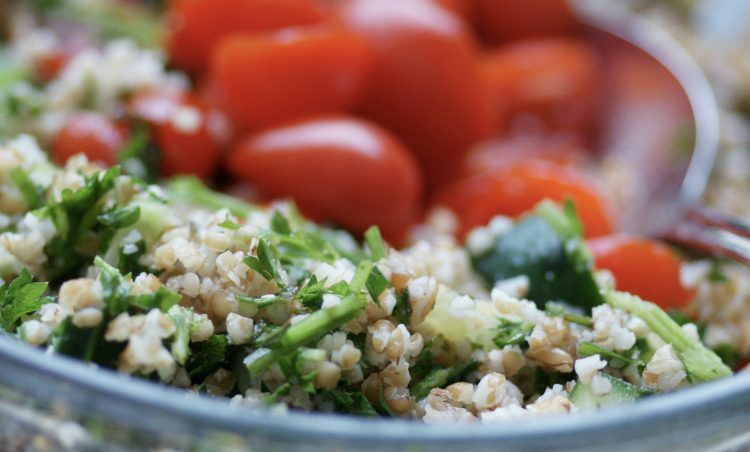 I have made tabbouleh with many different grains, but the amazing thing about bulgur is that it just needs to soak in water to become tender. 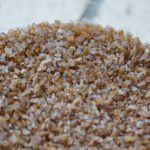 Cracked wheat is very similar to bulgur because they are both wheat. The difference is that cracked wheat requires cooking and the bulgur has already been partially cooked for us. Gluten free grains like sorghum or quinoa and other whole grains have to be fully cooked before adding the dressings, herbs and vegetables but they are delectable in their own way. Here is what bulgur looks like from the first minute I poured water over it to about 10 minutes later when all of the water is absorbed and a few minutes later when the bulgur is tender and fluffs easily with a fork. 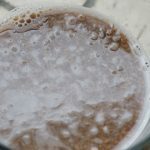 When I pour water over the bulgar, the water just sits on top for a few minutes. The grains are beginning to absorb the water. All of the water has been absorbed. I used boiling water but when time is not of essence,I will just use tap water. It takes a little longer but it is nice that my salad is cooler when I add the herbs and vegetables. 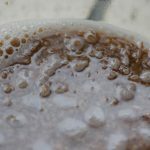 Even after the water looks like it has been totally absorbed, the grains still need a little more time to become tender. I like to fluff the grains of bulgar with a fork much like I would fluff rice after it is cooked. It adds some air and helps the bulgar stay in separate pieces which is great for the finished tabouli. I will often hear someone say that they use their food processor all the time, at least a couple of times a week. For me, that is more like a couple of times a day. It is a work horse in my kitchen and gets a meal on the table faster than anything else. For this salad, I run to my garden to cut parsley, mint and chives. While I let the water and bulgar sit right in the serving dish. 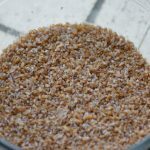 The amount of time it takes for the bulgur to absorb the water, is about the same amount of time it takes me to throw the herbs in my food processor and pulse several times. I want the herbs to still resemble the herbs in my garden but are small easy-to-eat pieces. Herbs from my garden are not always exactly the same as traditional tabouli herbs. 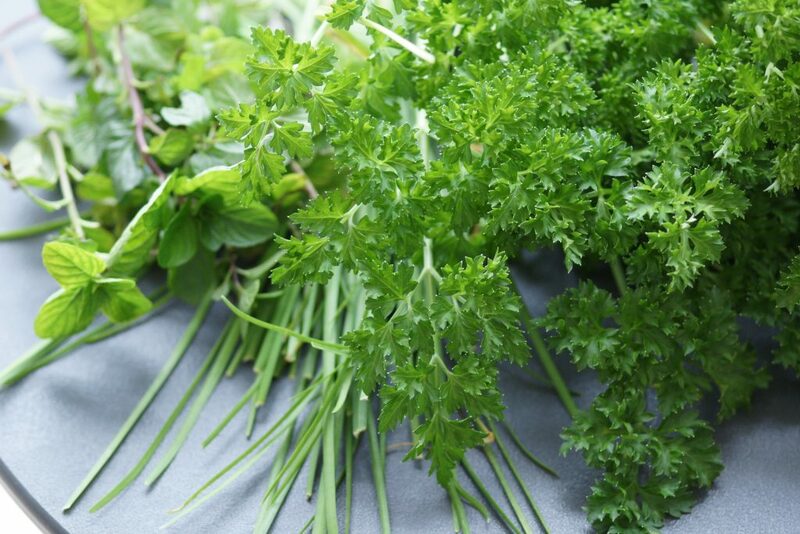 For instance, I prefer flat-leaf parsley for its flavor but all I had in my garden was curly parsley and it worked well. 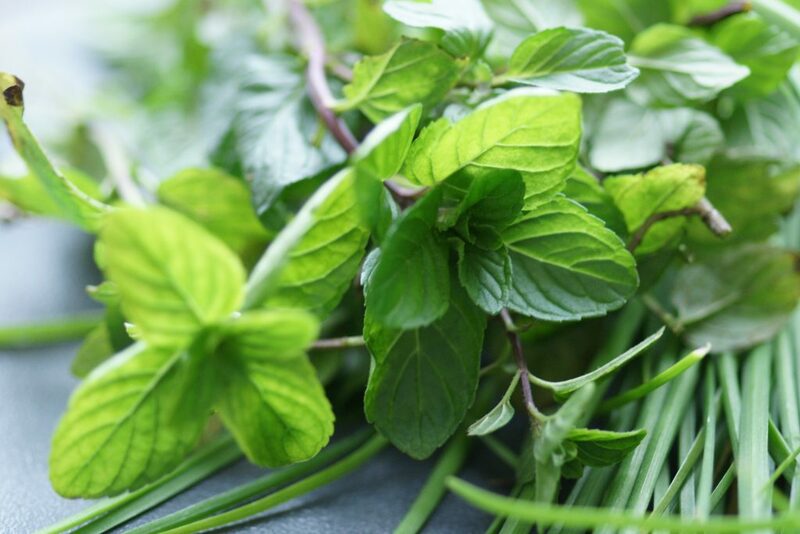 There are lots of different varieties of mint but I just used my favorite which is a savory mint as opposed to mint such as a chocolate mint that might go well with a dessert. I really like scallions in tabouli, but once again, I only had chives and they gave the salad a nice flavor. Crisp cucumbers and fresh tomatoes make this salad much better than more mature produce that might have lost their wonderful texture and some flavor. I think it is more important to find the freshest produce possible for this recipe so I do not worry about the variety, size or shape of the cucumbers. Each taste a little different but they are all delicious in this salad. I chop the tomato and cucumber by hand so they maintain a really nice presence in the salad. I quickly squeeze a fresh lemon, add some seasonings and a splash of good olive oil. It is ready to serve immediately but it gets even better as a leftover the next day. Place bulgur in serving bowl. Pour water over grain. Let stand 10 to 20 minutes. 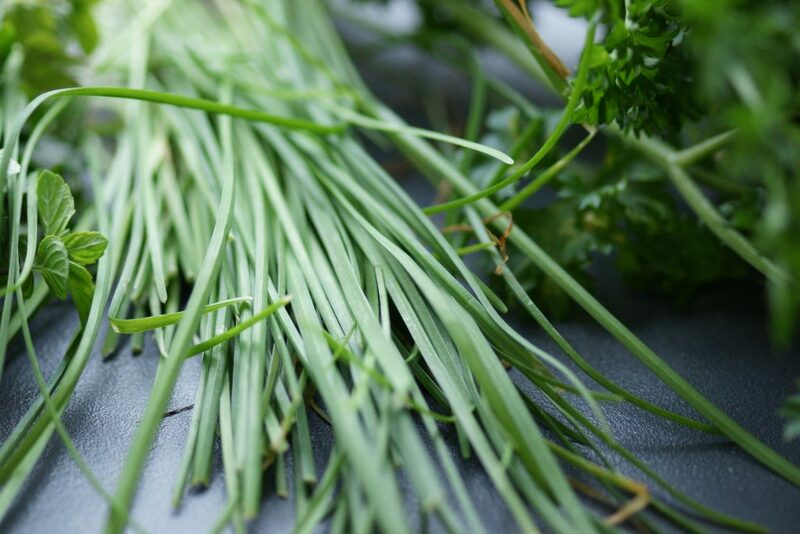 Combine parsley, chives and mint in food processor. Pulse until chopped. 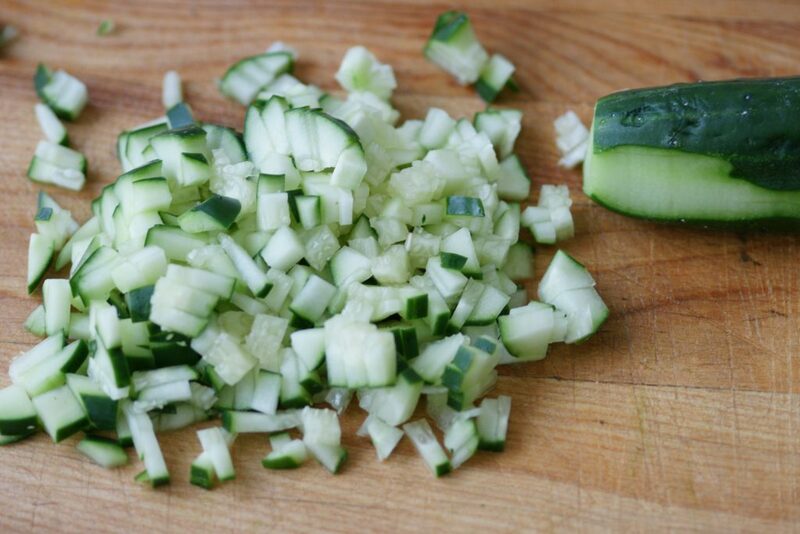 Add chopped herbs, cucumber and tomato to grain. Combine remaining ingredients and spoon over salad. Toss lightly and let stand a few minutes so vegetables can absorb flavors.